A first among Australia-only play for real money Casino Bonuses, the All Australian Casino is a relatively new entrant in the Online Casino world. Contact them on +61 (0) 2 8006 0112. L&L Europe owns and operates the All Australian Casino. The Lotteries and Gaming Authority (LGA) of the Government of Malta looks into the license and regulation of the Casino. L&L Online N.V offers a few of its games, and the Antillephone N.V regulates it. The introductory Bonus code at the All Australian Casino is pretty enticing – a 100 percent Bonus on deposits of up to AU$500. Of course, the transactions are all made in Australian Dollars, as the audience is within Australia. To claim the welcome Bonus, all you have to do is make a deposit between AU$10 and AU$500, and you can withdraw the amount after you fulfill the wagering terms. You can always expect free spins if you’re playing one of the new games at the All Australian Casino. Some days there are offers that let players increase their winnings by 5 percent or earn 10 percent back on their losses. The All Australian Casino even has an offer running where players can receive a Bonus of up to AU$250 if they hit “like” on the Casino’s Facebook Page. If you refer your friends to the Casino, you get Bonuses based on the deposits that they make. Each player can refer five friends. Featuring a wide variety of options from live land-based Casino games to online ones with free and wagered gameplay, players can get hooked to the All Australian Casino quite easily. The payout time is a speedy 24-hour period, which is another mentionable advantage of this Casino. With so many Top Australian Online Casinos out there vying for international attention, the All Australian Casino caters to a smaller audience and does a good job at it. Opening hours are from 7pm – 10am AEST and you can contact them on +61 (0) 2 8006 0112. With about 80 varieties of Pokie games offered on the All Australian Casino, some may say that this is a quite modest number when compared to Casinos in New Zealand. However, what it lacks in number it makes up for in variety, offering a wide range of games to match a number of playing styles. As far as table games go, the All Australian Casino offers nine Blackjack games, baccarat with different limits, Roulette (American, European and French), and even the odd Punto Banco. The All Australian Casino also offers stud poker, and over 20 video poker games which include Jokers Wild, JoB, and others. You will also find keno, bingo and lottery games on the Online Casino. All these games in the Casino can be played without any wagers, for free in the demo mode. Then again, the Casino offers a live land-Casino feature for its more daring players. In fact, this is a feature that sets the All Australian Casino apart from the rest. Players can take part in the Live Casino that features the Portomasco Casino, Malta from 8pm to 3pm New Zealand time, aside from engaging in live games in the All Australian Casino studio through the day. Players even get to interact with other players, as well as the dealer during the gameplay. Players can make deposits with the help of Neteller, MasterCard, Visa, POLi and Ukash. They can also use direct bank transfers, but these are chargeable. The players’ identity is verified at the time of the first withdrawal. You do not have to worry about your transactions being intercepted with the All Australian Casino, as they are protected using 256-bit Secure Socket Layer Encryption. 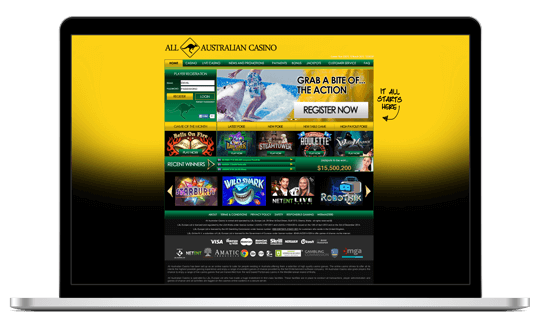 The All Australian Casino is seen to offer some of the best payout rates that you can see in the Online Casino industry. You will not have to worry about fair play on the Casino’s part with the All Australian Casino as it is known to use a certified Random Number Generator (RNG), keeping all dealings and gameplays transparent. 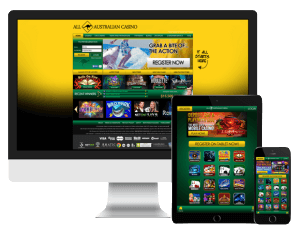 First look at the Online Casino and you can tell that it is meant for the Australian audience, with a prominent gold and green color scheme that is hard to miss. You will find banners talking about the latest Bonuses, the leading games, and the live Casino on the home page. Signing up barely takes a few minutes, and the best bit is that you can have a look at how the Bonuses, payments and others work even before you register. The All Australian Casino features games that are offered by NetEnt. These games can be played online using Flash Mode without calling for any additional downloads. If you are one of those players looking to try their hand at more of NetEnt games, then the All Australian Casino gives you just the platform. There are quite a few faults with the Casino such as the limited contacting hours, the phone only option and the lack of table games. This is why a 3 out of has been given.